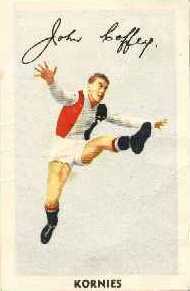 JACK COFFEY, coming from West St. Kilda C.Y.M.S. and De La Salle College, did not reach St. Kilda's side the easy way. After playing in practice games in 1948 he was not named even in the supplementary list. He then applied for a clearance, but it was not granted, and he played in the senior side in, the same year, appearing in eight of the last nine games. Last year he was chosen in the Victorian side, and finished that season with 25 games. Coffey has extraordinary pace off the mark, and his blind turn and left-foot kicking make him most elusive. Add to those attributes splendid marking and good disposal, and his deliberate balance before his fine drop kicking goes away, and one finds almost the complete player. He plays a little golf in the summer, is single, and is a school teacher.